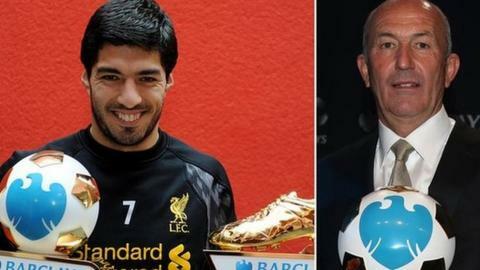 Liverpool forward Luis Suarez has been named the Barclays Player of the Season and Crystal Palace's Tony Pulis has picked up the manager award. Suarez, 27, who scored 31 times in 33 league games to help the Reds finish second, also won the Golden Boot having scored the most goals this campaign. Pulis, 56, took over at Palace in November and helped the club climb from 19th position to finish in 11th place. "This club has a great opportunity of pushing forward," said Pulis. "We finished sixth in the Championship last season and 11th in the Premier League this season. That's a 15 place jump." Suarez was also named Player of the Year by the Football Writers' Association earlier in May, taking 52% of the vote and finishing ahead of team-mate Steven Gerrard and Manchester City midfielder Yaya Toure.